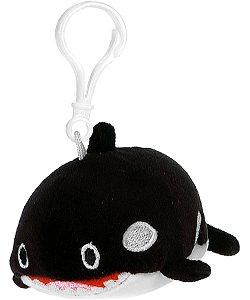 Kids love to collect keychains and clip ons and this adorable little plush orca (aka killer whale) backpack clip is the perfect collectible and take-along pal. Cute and cuddly from every angle, this orca stuffed animal clip on will delight at the first squeeze of its cuddly body which has soft white and black fur, black fins, embroidered details, including white spots, eyes, tongue and teeth, and an ever-smiling face. 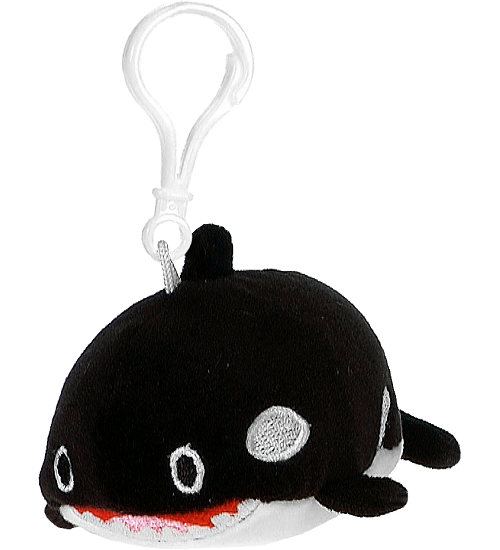 Complete with white backpack clip for attaching to your backpack, purse, belt loop, or simply looped around your finger, this plush killer whale clip on critter is great for on-the-go adventure as well as birthday treat bags, prizes, and giveaways. This cuddly plush shark backpack clip has soft gray and white fur and big toothy grin smile.